I'm not one to be silent for long, so now that my moment of silence for the Nelson family has ended, it's time to get down to business. My brother, Steve, and I have decided to use our Lotoja ride this year as a means to raise money for the Huntsman Cancer Institute, where Susan had her hip replaced last fall. My goal is to raise the equivalent of one paycheck for the Huntsman Cancer Foundation. To do this I'm seeking 80 donors willing to contribute the equivalent of one hour's wages. Given that my blog is small potatoes compared to Elden's, that means all six of you readers are on the hook to make a donation. It's really easy: all you have to do is go to http://www.active.com/donate/lotoja08/MAlbrec131 and click on the "make a contribution" box on the right-hand side of the page. Enter your contact information, your credit or debit card number, click submit, and you're done. It will take you less than two minutes--I know because I just primed the pump for you. I know how these things work--if you don't do it right away, you'll forget. So do it now. Click the link, take your wallet out of your pocket or purse, and punch in the numbers. I'd like to get to $800 in donations by the end of next week. Let's see if we can't get there even faster. Oh, and by the way, Lance Armstrong visited the Huntsman Cancer Institute earlier this week and liked what he saw. 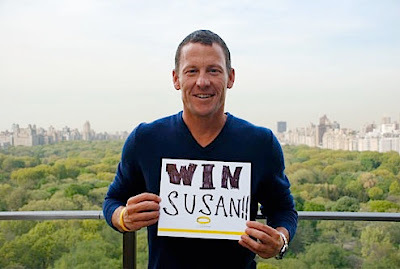 He's pulling for Susan to win just like the rest of us.